The Jordan River Utah Temple is the 20th operating temple of The Church of Jesus Christ of Latter-day Saints. 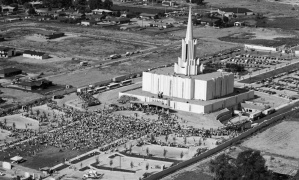 The building of the temple was announced on 3 February 1978. It is one of 17 operating temples in the state of Utah. 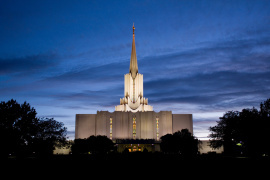 Located in South Jordan, Utah, it was built with a modern single-spire design. It is one of five temples featuring an Angel Moroni statue holding the gold plates. The other four temples which feature an Angel Moroni statue holding the gold plates are the Washington DC Temple, Los Angeles California Temple, Seattle Washington Temple, and Mexico City Mexico Temple. The exterior of the temple is finished with cast stone and white marble chips. Although the tower appears to be of the same material, it actually contains fiberglass in a product called cemlite in order to reduce weight. The Jordan River Temple serves members of the Church in Southern Salt Lake County, Utah. Geographically, this is the smallest Mormon temple district in the world, but the temple is one of the Church's busiest. The temple is the fourth largest Mormon temple and has a total of 148,236 square feet, six ordinance rooms, and 16 sealing rooms. The temple also has the largest capacity, with each ordinance room able to accommodate 125 people. It is located on 15 acres. The exterior of the temple is finished with cast stone with white marble chips. 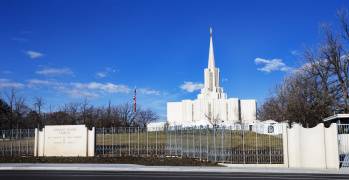 Unlike many of the temples, which are built mostly with tithing funds, the Jordan River Temple site was given to the Church and all of its construction was paid for by members in the 134 stakes within the temple district. A site dedication and groundbreaking ceremony were held on 9 June 1979. Spencer W. Kimball, then President of the Church, presided over the ceremony and dedication. Usually, during the groundbreaking ceremony, a small shovel-full of dirt is turned to represent the beginning of construction, but President Kimball felt that he should follow his oft-quoted motto "lengthen your stride," and used a large power scoop shovel to begin the building process instead of the small traditional groundbreaking ceremony shovel. 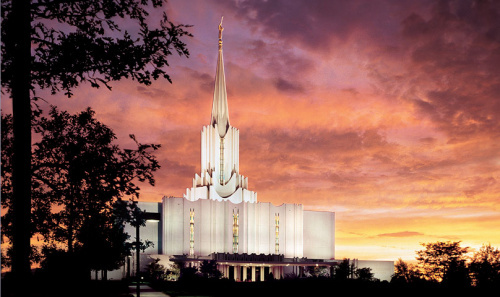 The Jordan River Temple was open to the public for tours 29 September through 31 October 1981. Over half a million people toured the temple during its open house. Marion G. Romney, a member of the First Presidency, dedicated the Jordan River Temple in fifteen sessions held 16 November through 20 November 1981. President Kimball was not able to give the dedicatory prayer, although he had prepared it because he was recovering from a recent surgery. He was in attendance at the first dedicatory session. More than 160,000 members were able to attend the dedicatory services. For a group of thirty in attendance at the dedication, it was a very spiritual and nostalgic event. These thirty elderly men and women had been at the historic dedication of the first temple in the Salt Lake Valley, the Salt Lake Temple. Most were very young but remember the event vividly. The First Presidency of The Church of Jesus Christ of Latter-day Saints has announced the closure of the Jordan River Utah Temple in the Salt Lake Valley. The temple will be closed from 15 February 2016 through the latter part of 2017 to undergo extensive renovation. 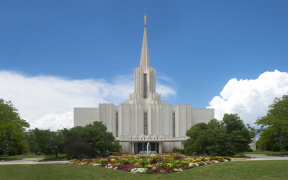 The temple was first announced in 1979 and dedicated in November 1981. Following the renovation, the temple will be rededicated. Other temples in the Salt Lake Valley - Salt Lake Temple, Draper Utah Temple and Oquirrh Mountain Utah Temple - are preparing to accommodate Latter-day Saints from the Jordan River Temple District while renovations are being made. 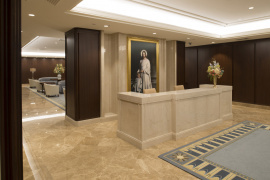 According to a news release from The Church of Jesus Christ of Latter-day Saints, since the temple’s closure in 2016, the "entire property, inside and out, has been refreshed with new finishes, furnishings, carpet, paintings, and murals. The plumbing, heating and air-conditioning systems have been updated, making the sacred structure more energy efficient with improved circulation. Seismic work and waterproofing have also been done on the foundation, a new roof has been added and landscaping has been refreshed." 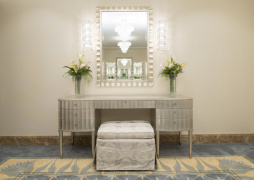 The following pictures of the Jordan River Utah Temple are from Deseret News - Courtesy of Intellectual Reserve, Inc. Entering the Jordan River Utah Temple. Crowds gather for the Open House in 1981. 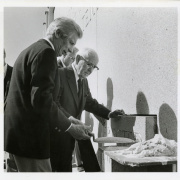 President Spencer W. Kimball seals the cornerstone in 1981. 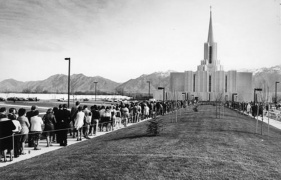 People going to the dedication of the Jordan River Utah Temple in 1981. Angel Moroni atop temple holding the golden plates. 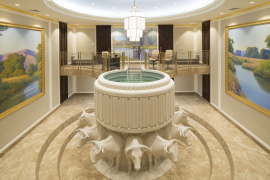 The baptistry in the Jordan River Utah Temple. 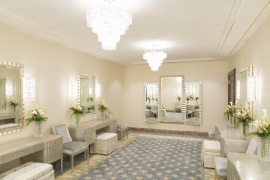 The brides room in the Jordan River Utah Temple. 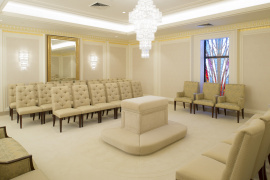 The celestial room in the Jordan River Utah Temple. 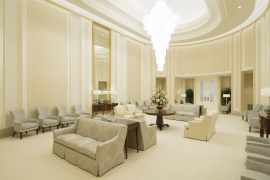 The chandelier in the celestial room in the Jordan River Utah Temple. 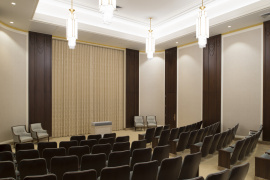 An instruction room in the Jordan River Utah Temple. Entry into the Jordan River Utah Temple. A painting of Jesus Christ in the Jordan River Utah Temple. 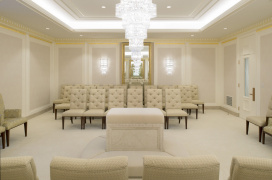 A sealing room in the Jordan River Utah Temple. The gate to the Jordan River Utah Temple. The Jordan River Utah Temple at dusk. The public open house for the renovated Jordan River Utah Temple was held from 17 March 2018 through 28 April 2018. An open house was not held on Saturday, 24 and 31 March because of General Conference sessions, and Sundays, 18 and 25 March, and 1, 8, 15, and 22 April, as per a letter dated 28 July 2017. The general public, including children of all ages, was invited to attend an open house of the Jordan River Utah Temple. Admission was free, but reservations were requested. Modest dress was required to attend the open house. Open house tours began with a short video presentation providing an overview of temples and why they are significant to members of the Church. Following the video, a tour host escorted visitors on a walking tour of the temple. At the conclusion of the tour, visitors were invited to a reception area for a free souvenir photograph (optional) and for answers to any questions they had. On Saturday, 19 May 2018, 17,000 young men and women danced and sang in a cultural celebration in the Conference Center on Temple Square in Salt lake City, Utah. The theme of the event was "Ready," from a scripture found in the 50th section of the Doctrine and Covenants. President Eyring told the youth in brief remarks before the performance: "My prayer is that this experience will lead to a lifetime of choices to make the temple a guiding star on your journey home to live forever in loving families with Heavenly Father and His Beloved Son. I am grateful to be on the journey with you. Thank you for your companionship today, and may this celebration be another step along our way." Of the 17,000 youths, Saturday’s celebration included a cast of more than 2,000 youths who participated as narrators, soloists, dancers and members of the celebration choir, band and orchestra. The remaining 15,000 teens joined the Conference Center audience and performed in various elements of the production. The cultural celebration was broadcast to meetinghouses in the temple districts. Featured was video footage of the activities held during the previous eight weeks that helped the youth personally prepare themselves to be ready for the rededication of the temple, providing them with an experience meant to build spiritual strength and unity for their temple experience now and in the future. One of the activities the youth participated in while preparing for the rededication occurred Saturday, May 12. Thousands of youth and their leaders walked, on a very rainy day, from their homes throughout the Salt Lake Valley to the temple, a journey for some of over eight miles. President Henry B. Eyring, second counselor in the First Presidency of The Church of Jesus Christ of Latter-day Saints, rededicated the Jordan River Utah Temple 20 May 2018. In an interview prior to the dedication, President Eyring said that during the dedication Sunday he will be feeling "echoes of the pioneers" who settled that part of the Salt Lake Valley "because of the faith they had." This is a "pioneering place." President Eyring also referenced the 1981 dedicatory prayer by then President Spencer W. Kimball, his uncle, and said it is "appropriate to our time." In the prayer, President Kimball talked about governments and the need to have righteous leadership and unity. Accompanying President Eyring in the rededication services were Elder Quentin L. Cook of the Quorum of the Twelve Apostles, Elders Timothy J. Dyches and Mervyn B. Arnold of the Seventy; Sister Joy D. Jones, general president of the Primary; and Bishop Dean M. Davies, first counselor in the Presiding Bishopric. The temple was rededicated in three sessions at 9:00 am, 12:00 noon, and 3:00 pm and broadcast to meetinghouses belonging to the Jordan River Temple area, as well as in the Draper Utah and Oquirrh Mountain Utah Temple districts. 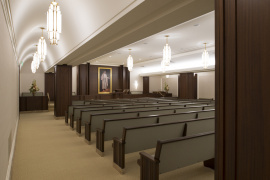 To enable the Saints to participate in the temple rededication and to place appropriate focus on this sacred event, the three-hour block meetings were canceled that day for those members of the Church. The temple will reopen for ordinance work on 22 May 2018. This page was last edited on 25 May 2018, at 10:32.